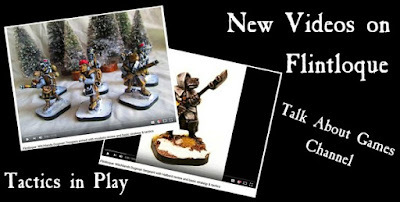 The third and forth parts of TAG channels videos on Flintloque tactics and his Dogmen Line concern themselves with melee combat and ranged combat. Talking About Games published the videos and though we provided the miniatures the videos are totally independent from us. Enjoy! All in the article on our blog and links from it. Also it is Flintloque week with 10% off the game system and a free Zombie in orders. Thanks!